To look her best on her wedding, every bride needs the best makeup artist in Hyderabad. UrbanClap offers brides the best bridal makeup services in Hyderabad at your doorstep. 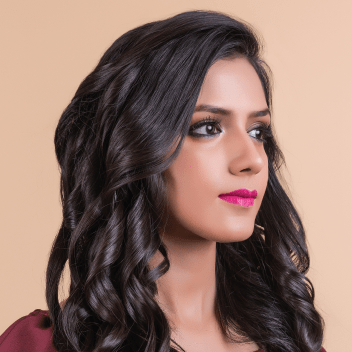 You don’t need to look for salons anymore, because we have got bridal makeup professionals across the city who are well-trained and experienced. UrbanClap lists varied bridal makeup packages prices in Hyderabad catering to all budgets. So what are you brides waiting for? Contact us for the best services and we will be glad to serve you. We hired Ramu n team for my cousins saree function. They delivered as they promised. Totally satisfied with his work.They were right on time like they promised and we were all complimented for our look that day.. So it was a great experience with them. Would definitely recommend him every time! Thankyou Ramu. Very neat and efficient. The bride couldn't have looked better. All thanks to Ramu. Amazing job! Swapna is brilliant, my 1st choice for any occasion is only her. My wedding bridal make up was phenomenal. My pre-wedding shoot and other occasions i only opt for her. What are you waiting for guys... Have swapna for u!!! I have to say that Swapna is extremely professional and when it comes to getting the best on your d day she will go that extra mile to make you look perfect. I was the bride's sister and she ensured that she made every time to make me look like a perfect bride's sister. She wont let you go out until she knows that you are looking drop dead gorgeous. She has worked for many reputed beauty institutions, such as Lakme and Toni&Guy. She has immense knowledge about all the products, beauty and makeup; she only uses branded makeup products like MAC, Krylon and the Airbrush. She was very well trained at the Lakme salon with various beauty techniques and methods. Her charges are also reasonable and worth her services. Highly recommended! Perfect makeup artist. She made me look beautiful for my wedding. Good nature and attitude. In time service. Extremely professional. I m really satisfied with sakshi's make up. I hired her for airbrush makeup.. It was so light and natural.. She knows very well that how to enhance the features.. I am happy with her work.. Check their portfolios in detail: You should ask for the portfolios of makeup artists when you have liked their works on the various social media channels. You must look for how varied they are with each bridal makeup they work on, which can be either bold or simple. Hiring a professional who creates the same makeup look on every bride would not be ideal, as you won’t get a customised look for your wedding. Good makeup artists take care of their client’s style choices. They also care about what makeup to put based on one’s skin type and colour. Checking their portfolios would also give you a general sense of their particular styles. Check if they are booked with other appointments on the dates of your wedding functions: If they are booked, ensure if they can find time to travel between the 2 or 3 appointments and for any delays. You would need to make sure that the MUA is not hurrying with your makeup on our wedding. I’ve Found 2-3 Bridal Makeup Artists in Hyderabad to my liking but how do I choose one? The moment you have narrowed down few makeup artists in the city, call them and ask whether they would be free on the different function dates of the wedding, such as the wedding, sangeet, and reception, among others. Ask them the brands of makeup products they use and what makeup types they prefer. The main types of makeup are airbrush, HD and traditional where airbrushing is a technique, and the other two are different products. It is a common makeup used on brides and has been around for some decades. Your MUA must be using traditional makeup products that are of high quality. It can be used on any skin type with any method, be it –fingers, brush, or sponge, it is versatile to be used for almost any occasion. It can give a look between high coverage and a sheer but most of the traditional makeup products are not waterproof. You would always get a fine result with traditional makeup if the MUA is skilled. But, it would be a problem if you have rough or uneven skin. The MUA would have to apply more to conceal the irregular parts which will show up on camera. HD makeup consists of ingredients that would not show the problematic areas of your face on HD cameras. Compared to traditional makeup, HD makeup is more liquid and looks sheerer. When applied, it offers full coverage. This makeup can give a good natural look on photographs. In the airbrush makeup method, a spray gun is used to put the makeup on the skin. Only a flimsy layer is formed when the makeup is applied with this method. It has a natural-looking finish that would never look patchy. With this technique, the makeup would last for 16 hours. However, you should never wipe the tears and sweat instead dab them. When the makeup is sprayed out of the gun, the foundation instantly oxidises with the air and you can see the actual colour of the foundation as soon as it is on your face. This is not the case with the other products and the foundation’s real colour shows up after 15 or 20 minutes. The makeup artist doesn’t feel constricted to move in and out of the problematic areas of the skin, which makes this technique a precise way of applying makeup. While there are opposing opinions about this technique, it is ideal for people with uneven skin as the MUA can control the makeup’s amount on the rough parts. It has a skin-like finish but the best part is that the makeup won’t look patchy through HD cameras. The airbrush technique creates a makeup look that looks properly blended. The wedding day bridal makeup costs more than the makeup for other wedding events such as sangeet, mehndi, and reception, among others. Booking the same MUA for multiple events would be beneficial, as you would get a discount on the total price. The bride has to pay for the travel and accommodation expenses additionally if the MUA is required to travel to another city. Draping of saree or dupatta. You should go for a trial session a month prior to the wedding so that you can find out how experienced is the makeup artist. Considering you have come up with an idea for a makeup look but it turned out different, the trial session will allow you to change it for your wedding day. Just do not hire an MUA, if she/he is not ready for a trial session or not sharing the list of services and the rates that she/he offers. Most likely, you would have to pay for the trial sessions and this payment would be adjusted with the final amount, considering you are booking the same makeup artist for the wedding. Full-face trial: In a full-face trial, the makeup artist shows a not so perfectly done makeup look for you to have a basic idea. This type of trial generally costs Rs. 1500. Half-face trial: You can compare how you naturally look when the MUA applies makeup to just one part of the face. With half-face trials, the MUA can also apply traditional makeup on one side and airbrush on the other, or, can show you how two different eye makeups look on each eye. Just talk freely with the MUA about your preferences and show any reference photos on how you want to look. Also, show your wedding outfits if it is confirmed so that the makeup artist can give you a complementary look. Know about what makeup products she will use and if they will go well with your skin and also feel free to discuss other concerns such as eyelash and hair extensions. When the trial session starts, watch what the MUA does and listen to what she says meticulously. Asking your relative or any close friend will be fine but make sure to make a list of what you prefer. You can also engage in a video call with the MUA once the trial is over to talk over the details what you would prefer on you. If the MUA puts makeup depending on your skin type. If your skin is oily, a mattifying foundation would be required. If should not be any rough lines after the makeup is applied as the blush, foundation, contour, and eye makeup should mix properly. The base should appear natural. If more blush is applied on your face, it can look cakey. After applying makeup, check the look by clicking photos in artificial and natural lights to see if the foundation is of the same colour as the colour of your skin or if the makeup artist has hidden away the acne marks and other blemishes. Also, check if the dark circles are covered to the right amount as it can look odd if they are fully covered. Take into consideration how long the makeup would last. Ask important queries: Make sure to catch up with the makeup artists and ask what line of products they would use. You should know this especially, if your skin is sensitive and if some ingredients in the products make you allergic. 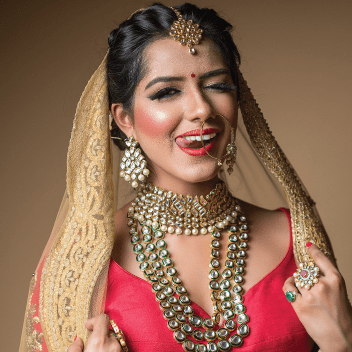 Ask around the costs of bridal makeup services in Hyderabad to have a better idea but do not book makeup artists just because they offer services at low prices. Enquire how they go about maintaining the quality and what products they use. Always look for the balance between cost and quality. Check their Hygiene Practices: You should never book a makeup artist who keeps a disorganised kit. A professional makeup artist should only use brushes that are dirt free, makeup sponges that are washed regularly, and mascara wands that are disposable along with a mixing palette for the products. They also should disinfect the makeup frequently and should know where the products are kept in the kit. See how they react when they listen to your preferences: It is essential that a professional makeup artist is concerned about the style preferences of the clients. Ideally, you must show the MUA some reference photos of how you want to look and they should recommend you the best ideas for you to get that makeup look. Never book a professional makeup artist who is not paying attention to what you say and pushing her views on you. You should check how much and when you would need to pay along with the cancellation policy and payment mode. Check the number of people the MUA would bring along in order to provide adequate space for them. 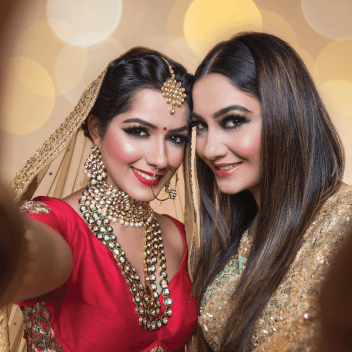 Hiring the same MUA would save money and it would be easier to ask for changes later with the passing wedding functions such as sangeet, or reception. You must book another MUA who can apply makeup to your friends and relatives as the bridal MUA won’t have time to put makeup on anyone else apart from the bride. You MUA in all probability would know of other makeup artists who can attend to the others in your family. Any facial treatment has to be done 2 days before the makeup is applied. Waxing and threading should be done a day before for the skin’s redness is able to settle down.